Marissa Markonish is the Head of Lower and Middle Schools at North Yarmouth Academy. Marissa joined the staff at NYA in 1995, teaching Latin in both the Middle and Upper Schools. She holds a BA in Classics from Wesleyan University in Connecticut and an MAT in Latin and Classical Humanities from the University of Massachusetts, Amherst. Marissa moved into the role of Head of Middle School in 2010 and helped to open the Lower School in 2013. 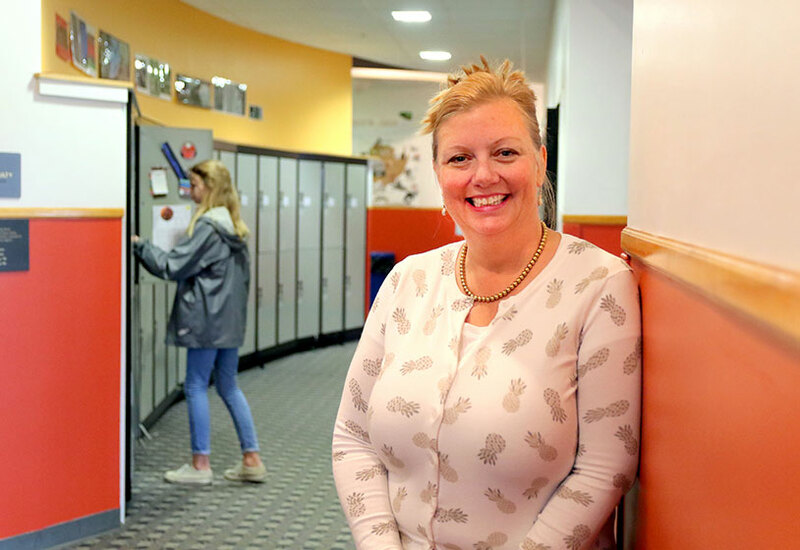 In her current role as Head of Lower and Middle Schools, she enjoys implementing an engaging and dynamic program for our students from toddler through eighth grade. Too often in life, we feel that our schedules control us rather than the other way around. Nowhere is this more apparent than in schools. We have high expectations for our students at NYA and expect them to be “on” in the classroom – prepared, focused, and actively participating. To help them do so successfully, we must balance time in the classroom with downtime for socializing, eating, and movement. The school schedule is at the core of every passing day, week, and year, setting the stage for everything that transpires, both in and out of the classroom. At many schools, the schedule makes both teachers and students feel like hamsters on a wheel, always running, running, running, with no end in sight. Students move from class to class with minimal passing time, absurdly short and early lunch breaks, and little time to relax, reflect, or connect with friends. It is easy to feel that we are at the mercy of the schedule, when in reality the schedule is there to serve our needs. When constructing the schedule for the Middle School at North Yarmouth Academy, numerous factors come into play, but the needs of the students always remain at the core. Our Middle School schedule is designed with the needs and the physical and cognitive development of the young adolescent in mind. While our day begins at 8:00 a.m., the building is open at 7:00, and many students arrive early to settle in, chat with friends, or see a teacher for extra help. Our periods are approximately 45-50 minutes in length, allowing teachers sufficient time to introduce and practice new content without overwhelming the students. The academic day begins with the first two periods back to back, followed by break. During this time, students walk over to the cafeteria, getting a blast of fresh air, and then enjoy a morning snack and spending time with friends. We return for another class, followed by a music and study hall block. Most teachers are free during this block, making it an ideal time to chat with an advisor or see a teacher for extra help. Students then enjoy a 45-minute break for lunch back at the cafeteria and recess outside. Many middle schools eliminate recess from their schedules, but research shows that the adolescent mind and body crave movement breaks, and students are happier and better able to concentrate when this time is included each day. After recess, students have their final two classes of the day and then head off to sports practice, drama rehearsal, or an athletic contest. The pacing of the day – two classes, break; two classes, lunch and recess; two classes, practice – divides the day into manageable chunks for students, interspersing periods of concentration with periods of relaxation. A well-constructed schedule can improve the student experience and offers time to nourish mind, body, and soul. What better way to set students up for success?